The numbers show that the economy is growing, and jobs are being created. But for workers navigating the current employment landscape, things can be confusing. There are sectors shedding many workers, yet employers bemoan a lack of skilled workers. Minister in the Prime Minister's Office Chan Chun Sing says some people have told him that "the economy is very confusing. Sometimes they tell me it is doing well, sometimes they tell me it's not doing well". The key to bridging these two narratives, says Mr Chan - who is also labour chief - is to move people from the sectors that are slowing down to those that are doing well. This is where government-funded skills training schemes, such as Workforce Singapore's (WSG) Professional Conversion Programmes (PCPs), come in. The scheme places professionals, managers, executives and technicians (PMETs) in jobs or attachments in growth industries, where they then undergo training. When it was first launched in 2007, it was aimed at helping mid-career workers hoping to make a job switch. It is now one of the key tools against skills mismatch, and extends to helping professionals prepare for new jobs in the new economy, even within the same company. Ms Julia Ng, group director of the Enterprise Development Group at WSG, says her team learnt an important lesson after the global financial crisis hit in 2008. The economy rebounded more quickly than expected, and retrenched workers who had not completed their training programmes appealed for the courses to be shortened so that they could ride on the recovery to get new jobs. "We realised that PCPs had to be nimble enough to respond to market changes, so as to keep our workforce agile and workers ready to take on the next career in the shortest time possible," she says. The scheme was refined. Courses were thus shortened, and people were placed in companies to be trained on the job. Now, there are more than 100 such programmes, for occupations ranging from social workers to data analysts. Ms Ng says: "We can be approving at least one or two new PCPs a week." Last year, 3,300 Singaporeans were placed in new jobs through the scheme, up from 1,300 in 2016. Critics of such job training have said it is costly, and ask why companies are not paying to train their own workers. To encourage employers to offer jobs for PCP, they can get wage support of up to $6,000 a month per worker, and this money is on top of training subsidies averaging $9,000 for a six-month course. But Minister in the Prime Minister's Office and Second Minister for Manpower Josephine Teo suggests that companies can always choose to leave Singapore if they cannot find the workers they need. "So rather than tear our hair out and bemoan the fact that the companies need to be more proactive, I think we would rather be practical," she says. "You want to be able to say to the companies, 'Look, if you do your part, you will get support'. "It is a far better way to provide support to companies than by giving them tax breaks that they shouldn't get or artificially tilting the rules of the game in their favour." Some have wondered just how long the workers stay in the new industries. WSG chief executive Tan Choon Shian says while it will be easy to mandate a period employers and employees must stick with, the rules also have to be flexible enough to encourage companies to take a chance on new hires. "Imagine you are dating and before the first date, the father of the other side says, 'I want to interview you. Are you serious or not?' Then the first date won't even happen," he says. There is a fine balance needed, he explains. If a programme is too employer-centric, it may not be helpful for the job seeker. But if employer needs are not met, the programme will not take off. Even within companies, it must make sense to the chief executive, the human resources department and the supervisors who will work with the new trainees, he says. PCPs are one of the main tools in WSG's Adapt and Grow initiative. The Government announced in 2016 that it would commit an additional $35 million a year to support programmes under the initiative, and promised yet another $26 million a year last year. In an environment where disruption affects the various sectors unevenly, measures have become more "targeted and surgical", says Mr Chan. WSG launched three new programmes last July after staff noticed that some job seekers faced emotional issues, the lack of a clear action plan and a lack of networking opportunities. Such programmes, and industry-specific PCPs, are like the candles on top of a birthday cake, says Mr Chan. The layers of the cake - "horizontal policies" which are broadbased and foundational - are still required, but increasingly, there is a need for more specific policies that still allow for some customisation to suit workers' and companies' different needs, he adds. While Adapt and Grow seeks to treat the pain of transitions into new jobs and industries, on the flip side of the same coin is SkillsFuture, which aims to raise workers' immunity to the effects of disruption. On the 18th-floor offices at 1, Marina Boulevard, Mr Ng and Mr Tan sit in adjacent rooms. Their staff walk freely across the offices, and there is no clear demarcation of where SSG ends and WSG begins. The agencies even share the same website. These are more than symbolic gestures, and are physical reminders that education and employment must be yoked seamlessly together as the country prepares its workforce for the future economy. Four years since Deputy Prime Minister Tharman Shanmugaratnam first coined the name SkillsFuture, it has evolved beyond the recommendations of the two reviews, and those involved now describe it as a movement. "We hope eventually to see a shift in societal culture," Education Minister (Higher Education and Skills) Ong Ye Kung, who spearheads the initiative, tells Insight. If lifelong learning becomes a way of life, having to constantly retrain and reskill will hopefully no longer seem like a daunting task for workers, so the theory goes. The work of changing mindsets, though, starts in schools, which is why SkillsFuture is parked under the Ministry of Education as an integral part of the education system, adds Mr Ong. Most people remember the initiative for one of its programmes, the SkillsFuture Credit. It was rolled out with a big bang in 2016, with all Singaporeans 25 years and older given an individual learning account and $500 in credits to pay for courses offered by hundreds of training providers. The Government has said it will make periodic top-ups to the account, though Mr Ong says there are no plans to do so for now. The scheme is often criticised for being too broad, with some wondering why taxpayers are funding people to take courses in flower arrangement and Korean language. Mr Ong says SkillsFuture Credit has achieved its purpose as long as it has raised awareness about the SkillsFuture initiative and got people excited about taking charge of their own learning. It is kept intentionally broad and not overly prescriptive, so that people can take whatever courses interest them. To put things in perspective, he says, the $500 credit comes up to about $40 million a year, while funding that goes towards subsidising courses comes up to $700 million. In all, the Government spends about $1 billion a year on SkillsFuture. Besides the credit scheme, this covers a plethora of programmes for students and workers, such as study awards, work-study programmes and courses to explain emerging technologies and trends. Asked if it is money well spent, Mr Ong says: "The issue of returns on training is one that has vexed policymakers for decades and I do not think we will have an answer and have a key performance indicator that measures and therefore says that 'I will be successful'." SkillsFuture does not exist in isolation, and must be seen alongside other indicators, such as the good track record of the education system and quality of the well-regarded workforce, he adds. SSG's Mr Ng says each programme under SkillsFuture is tracked, but the numbers tell only part of the story. What is more important is if cultural change has taken place, he adds. The best place for job-specific training is in companies themselves. Mr Chan describes them as "living labs". With the older model of teaching, he says, three to six months is needed to figure out what the market needs. The same amount of time is needed to craft a syllabus, and even more time is taken to mobilise and train workers, he says. Workers emerge from such training with a "history degree", he quips. "Not as in a history subject, but a degree with historical knowledge." Helping companies create bite-sized, timely courses is key to making the system work, he says. The Government, unions, trade associations and business chambers have been working with companies on industry transformation maps which chart the changes expected in 23 key industries over a five-year period, and identify the skills required. The plans, which come under the $4.5 billion Industry Transformation Programme, will help to create a culture in which "businesses are always transforming and people are always adapting", says Mrs Teo. SSG set up an enterprise engagement office last month to reach out to more employers, and plans to focus on working with trade associations and business chambers this year, says Mr Ng. WSG also has a team of about 80 to 100 people who liaise with employers and sector agencies. Mr Tan says companies are becoming more proactive in requesting help to craft training plans for their workers. Some banks, for example, have started intra-company PCPs to prepare their workers whose jobs are being disrupted, such as customer service officers who upgrade their skills and move into new roles, like serving customers through live chat or video teller machines. Mr Ong says he is working to matchmake industry players with the institutes of higher learning to come up with more training courses. The hope is that this will help to fast-track the development of an apprenticeship system here, where companies help to train people for the industry, he says. In Germany and Switzerland, such systems took more than a century to build, but Singapore does not have the luxury of time. The labour movement is also pitching in with its own bite-sized courses that people can take while waiting for the bus, says Mr Chan. But the many programmes available will count for nothing if workers do not come on board. For those in employment, preparing for a job loss may not be foremost on the agenda. Mr Chan says the challenge is to convince someone that his job is going to be threatened and his skill sets need to change. "If you are out of work and I convince you to go for training, it's one order of difficulty. If you're employed and I tell you, 'Tomorrow your job is being threatened, you need the following skills', there's always inertia," he says. Even for those who worry about their jobs disappearing, it may not be obvious what skills they should gain to remain relevant. A bus driver may know his job could be made redundant by driverless buses, but what skills should he pick up next? This is what the career coaches at WSG's Careers Connect help people figure out. The situation looks promising, says WSG's Mr Tan. There appears to be less stigma now about approaching career centres, whatever the stage of one's career. When he took on the job, he was actually nervous that people would shy away from him when introduced, or tell him they hoped they would never need his services. "In fact, most people say, 'Oh, you're a good person to know. When I need your services, I know whom to call'," he says with a laugh. To refresh its image, WSG revamped its three Careers Connect centres in Paya Lebar, Woodlands and Tampines last year to be more cheery and make resources more accessible to walk-in visitors. "We do not want to be perceived as a place you come to only when you're in trouble," says Mr Tan. These days, about a quarter of the job seekers who register with WSG's Careers Connect and the National Trades Union Congress' Employment and Employability Institute centres are not unemployed. WSG career coach Andrew Er says his role has changed from focusing just on helping people with their job search, to a more collaborative relationship in helping them achieve career goals. "I'm very heartened to see more people taking ownership of their careers," he adds. Going forward, Mr Tan wants to focus on growing WSG's online presence to reach a larger pool of working adults, beyond those who participate in its programmes. "(We want) people to feel comfortable to come whenever they want to tap our resources, have a feel where the labour market is going, where the future industries are going," he says. Although the hope is that more people will become aware of the need to prepare for disruption and get trained, Mr Tan does not expect his job to get easier. He says: "If everyone becomes very fit for the job, the person least fit for the job would have a struggle getting a job, then I would help that person. So that bar goes up." As Singapore looks to stay ahead of the curve in developing its industries to compete globally, the shift towards higher value-add foreign workers is something that the Government wants to encourage. But raising the skill level of foreigners in Singapore is a knotty issue - Singaporeans worry it would intensify competition for good jobs. Minister in the Prime Minister's Office Chan Chun Sing says the answer is to ensure locals are quality workers, too. "We cannot dumb everybody down, right? That's why we work so hard to move our people up." In an interview with Insight, he recounts an occasion when he asked a student about the type of foreign worker he would want to work with - above average or below average. The student answered: "Above average but below me." This shows that he knows good talent is needed for the country to progress, but he also feels the tension, says Mr Chan, who is secretary-general of the National Trades Union Congress (NTUC). Thus, the way forward is to level up locals. "The Singapore average must be above the regional and global average," he says. On the issue of bringing in higher-skilled foreigners, he gives the example of the construction sector, which employs more than 300,000 foreign workers. If it raises productivity by 1 per cent, those jobs could be replaced by 3,000 foreign information technology, wealth management or biotechnology professionals instead, helping to boost Singapore's capabilities in these areas. At the same time, companies here which employ such professionals should help transfer expertise to locals, he says. "I've no problem employing the high-skilled foreigners to come here - we have done that ever since the 1960s - but there must be a process of localisation whereby my own domestic workers, my own local workforce, can progress," says Mr Chan. One government effort in this area is a pilot scheme started last year called the Capability Transfer Programme, which subsidises the cost of companies bringing in trainers from abroad to arm local workers with skills and knowledge of new technology. But the question of quality is part of the puzzle. The number of foreigners working here was also a major issue earlier in the decade, when Singaporeans were concerned about competition for jobs and the strain on infrastructure. Although there is no fixed formula for success, the balance of two locals to one foreigner in the workforce looks set to stay for now. Both Mr Chan and Second Manpower Minister Josephine Teo reiterate that this ratio is about right. "There's no magic number but where we are at the balancing point now is about one-third, two-thirds," says Mr Chan. The local workforce, comprising Singaporeans and permanent residents, is about 2.3 million in size now. There are another 1.4 million foreigners working here. Local workforce growth has been slowing due to the ageing population, even as more women and older workers take on jobs. Last year, it expanded by an estimated 0.9 per cent, slightly better than the rates of 0.5 per cent and zero in the previous two years, but down from 4.4 per cent in 2014. By 2020, the size may well be stagnant, says Mrs Teo, in a separate interview with Insight. And with tighter foreign labour policy and contractions in industries like construction and marine, the growth of the foreign workforce has slowed too - the estimate for last year shows it actually shrank. Taken together, these trends mean that employment growth can no longer be relied on to drive economic growth. So to keep the wheels moving, productivity will have to go up. This is because economic growth comes from employment growth, which is how fast the workforce expands, and productivity growth, which is how much additional output each worker can produce. "The more you are able to do productivity-driven growth, the less dependent you are on manpower growth, which works to our advantage," says Mrs Teo. One programme to encourage this is the Lean Enterprise Development Scheme, launched in 2015 to help businesses reduce their reliance on manpower through using technology and changing operating processes. It has been tapped by over 5,200 enterprises. Such efforts could be paying off - last year, economic growth of 3.5 per cent was almost completely from productivity growth. So it is possible to maintain flat employment levels, with no increase in the number of locals or foreigners, but that may not be ideal. Realistically, the workforce needs a little bit of growth to support "enterprise activity", says Mrs Teo. Monetary Authority of Singapore managing director Ravi Menon also said at a recent conference that while the share of foreigners in the workforce cannot increase without end, there must be some flexibility in the local-to-foreigner ratio to match economic cycles, changing circumstances and opportunities. Mrs Teo explains: "An economy must be able to accommodate activity by new businesses and existing businesses getting into new lines of businesses. "If the only way in which businesses can grow is by taking employees from other businesses, there will be more friction. So you have to allow for a little bit of growth." 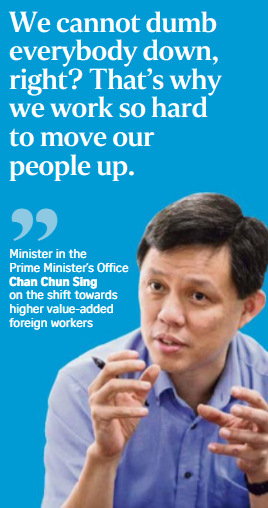 A trip to the post office during his student days in Britain drove home to Minister in the Prime Minister's Office Chan Chun Sing the importance of redesigning jobs for older workers. It was in the late 1980s and Mr Chan was studying economics at Christ's College at Cambridge University. Wanting to ship his books back home, he packed them into a 20kg box and lugged it to the post office, only to be told that it did not accept 20kg boxes. He was told to repack the books into boxes of 5kg each, which would have cost more in total to ship back. Recalling this, Mr Chan quips: "I thought they were trying to smoke me. I looked at (the postal worker) suspiciously, I didn't understand." It was only on further reflection that he realised the Royal Mail's real purpose - to make sure the older postal workers would be able to carry the boxes. 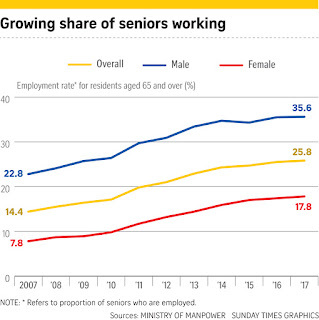 Over the past 10 years, more older people have been employed, and the proportion of people aged 65 and older who are working has gone up from 14.4 per cent to 25.8 per cent. 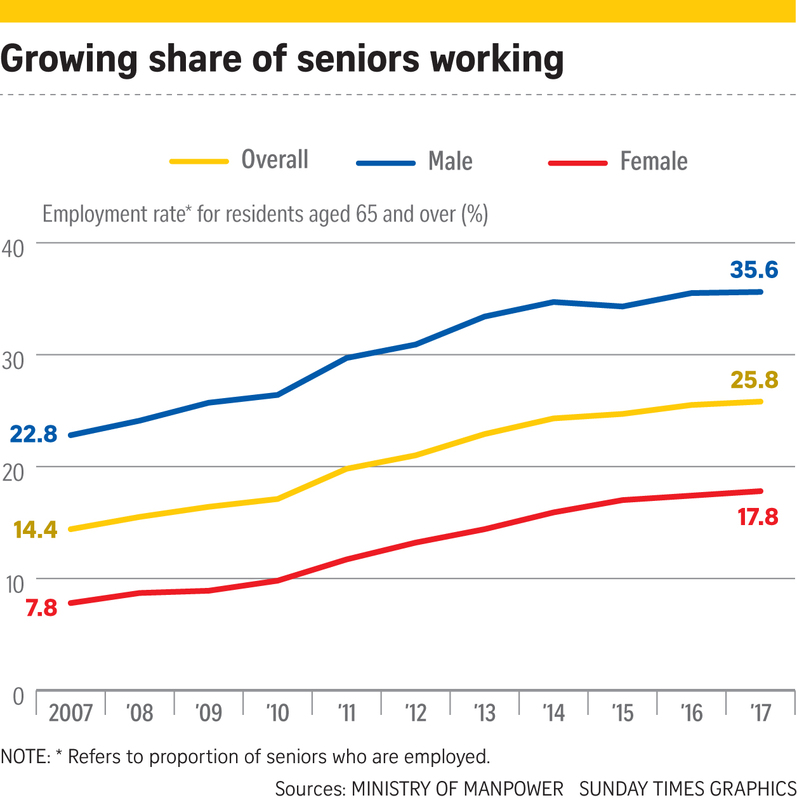 Mr Chan, who is also labour chief, says Singapore, too, must redesign jobs to accommodate older workers as the population ages, so that those who want to work can find gainful employment. While they may have been slowed down by age or have poor eyesight, for instance, they are still capable, he adds. Sometimes it is about making sure the workflow is designed with such workers in mind, he says, citing an example of a canteen in Japan run by three "80-year-old aunties". People order and pay for food from a machine, and there are implements on each table for them to clean up after themselves and a tray-return area. The workflow allows the women to run the place, and "concentrate on the highest value-add, which is cooking the best dishes", he says. Minister in the Prime Minister's Office and Second Minister for Manpower Josephine Teo says jobs are already being redesigned for older workers. The security industry, for instance, is working on using technology such as closed-circuit television cameras and video analytics to augment the work of security guards so fewer guards will have to work the graveyard shifts. "You can't mandate the older person to work, you can't mandate the company to hire the older person, but you can improve the conditions to the point where they want to do it," she says. Singapore is no more than one-third of the way into its SkillsFuture journey, and there is a long way more to go in developing a culture of continuous training and learning, Deputy Prime Minister Tharman Shanmugaratnam said. He said employers have been slow to embrace training, adding that more engagement is needed to help companies see the benefits of investing in their employees. To speed things up, SkillsFuture Singapore (SSG) will focus its efforts on bringing on board small and medium-sized enterprises (SMEs), which are facing challenges adapting to the changes wrought by globalisation and technological advances. Mr Tharman, who chaired the SkillsFuture Council set up to look into lifelong learning in 2014, was giving an assessment of the initiative at a Jan 11 interview with The Straits Times. Describing his take on the journey as an "impressionistic statement", he said: "It's not fast enough and we need to step up the pace... There's a long way to go, especially to develop that culture among employers." Smaller businesses, particularly, are impeded by inertia. SSG chief executive Ng Cher Pong said while many bosses recognise the need to upgrade their workers' skills as they transform their businesses, some SMEs do not know about training opportunities and funding support available, or lack the capabilities to draw up and implement training plans for workers. The tight labour market has also deterred them, as it means workers can easily leave for another job after money is spent on training them. Mr Tharman said: "But, really, what you want is a culture where even if people are moving, what goes around comes around. So if every employer is investing in their people, the quality of the new hires you get will also be higher even if you lose some of your own." To better reach out to these companies, SSG is working more closely this year with trade associations and business chambers, and has set up an enterprise engagement office. The statutory board is also involved in the industry transformation maps being rolled out for various industries, to explain to the firms how training can support their transformation. Mr Tharman said courses must make sense for employers, and curators are being trained to better curate courses. Said Mr Ng: "For us to move the needle on SkillsFuture, we really need to have many more SMEs come on board, because ultimately SMEs employ the bulk of our workforce. If the SMEs are not embracing this, then it's an issue." He added that SkillsFuture ultimately is a movement to change mindsets about lifelong learning. To measure how effective it is, SSG is closely monitoring a basket of indicators, such as the participation rate of specific programmes and the national training participation rate. SSG is also looking at how to measure whether the training culture has changed, and is mulling over a survey, said Mr Ng. Mr Tharman said that culture has to be nurtured, and will not happen instantaneously. "Every society has this same problem. We are going about it much more systematically than most, in a very deliberate fashion. There's no other country with as deliberate a strategy as SkillsFuture," he added. The number of Singaporeans who have used their SkillsFuture Credit has more than doubled last year. 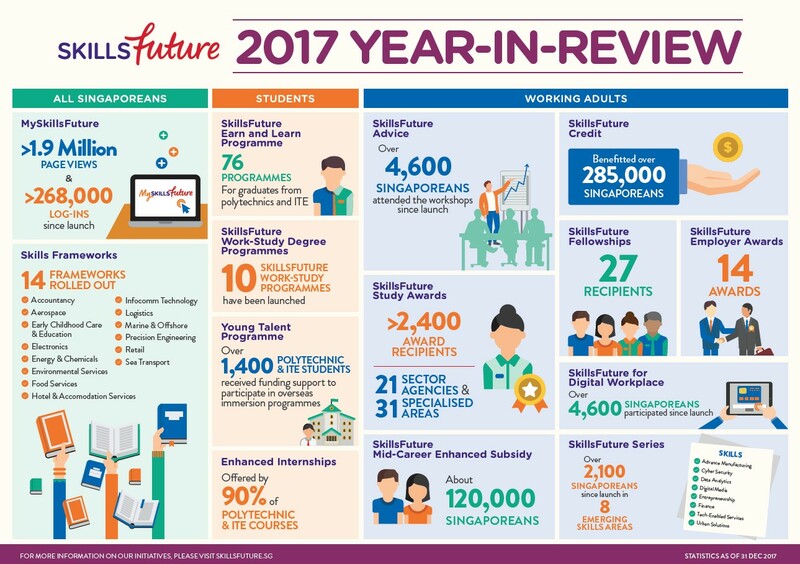 And the good take-up rate across the various SkillsFuture schemes is a "positive sign" that people are charting their own learning and career paths, said SkillsFuture Singapore (SSG) chief executive Ng Cher Pong as he gave the media an update yesterday. In all, 160,000 Singaporeans began using their SkillsFuture Credit last year, bringing the total number of users to more than 285,000 since the scheme was launched in January 2016. In the first year, over 126,000 people used the scheme, or about 5 per cent of all eligible Singaporeans. The $500 credit is given to all Singaporeans aged 25 and older to be used for training courses, as part of the Government's effort to get people thinking about lifelong learning. The most popular course category last year was infocomm technology. And the people who used the credit last year were spread across various ages, with slightly higher use by those in the 25 to 29 and 30 to 39 age groups. The SkillsFuture initiative has been hit by false claims scams. Last December, it was reported that SSG was cheated of nearly $40 million - the biggest case of a government agency being defrauded here. Asked about the scams, Mr Ng said major internal changes are being made, and updates on a data analytics fraud detection system being installed will be provided later. In changing the internal processes, he said, one focus is to ensure it does not make it harder for people to upgrade skills. "We should not make Singaporeans suffer because of a few black sheep," he added. Many bosses recognise the need to upgrade their workers' skills as they transform their businesses but there is still some resistance, especially among smaller businesses. The reason, he added, could be that they do not know the training opportunities available or lack the capabilities to draw up and implement training plans for workers. The agency set up an enterprise engagement office last month to reach out to more employers, he said. It will work with other government agencies as well as trade associations and chambers of commerce. Mr Ng also gave an update on various SkillsFuture schemes. For example, more than 4,600 Singaporeans have used the SkillsFuture for Digital Workplace (SFDW) programme since it was introduced last October. It provides a basic understanding of emerging technologies and trends - like data analytics - and how they impact work. More than 2,100 Singaporeans have also attended short courses in emerging skills areas under the SkillsFuture Series, which was also launched last October. "The progress is encouraging but there's still clearly quite a long way to go," he said, noting that some of the programmes are still new. Mr Ng also said the outcomes of individual programmes are tracked closely, but it is hard to find a single indicator to measure how well the SkillsFuture movement is building a culture of lifelong learning. Rather, the agency looks at several indicators, including training participation rate, studies by international bodies on lifelong learning in different countries, and qualitative feedback from users, he said. For Mr Au Hoong Chiu, who sells health supplements, attending an SFDW course by training consultancy Rohei last November opened his eyes to "what the digital world is like". The 59-year-old previously used the Internet only for e-mail and did sales work mostly in person. Now, he uses his company's online portal to send information to potential customers abroad. "I'm still taking baby steps. We have to continue to learn. Otherwise, we'll get left behind," he said. Since becoming a career coach at Workforce Singapore (WSG) six years ago, Mr Andrew Er, 30, has not just linked job seekers with suitable opportunities - he has been consoling those who are in tears and helping others identify the emotions they are experiencing. While he used to serve more rank-and-file workers, more professionals, managers, executives and technicians (PMETs) are coming forward for help. The past few years have been especially hard on this group, he notes. He recalls one business development manager - the sole breadwinner of his family - who, after 23 years in his first and only job at a lighting manufacturer, was retrenched. The man said he felt useless. "I felt the pain of his job loss as he shared with me that he was at the lowest moment of his life," says Mr Er. 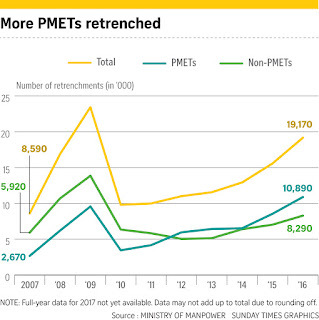 Statistics show that PMETs make up a growing share of the resident workforce, and they also make up more of those retrenched. Nearly six in 10 people who lost their jobs in the first nine months of last year were PMETs. Similarly, middle-aged and middle-wage workers are one of the main groups that Minister in the Prime Minister's Office Chan Chun Sing is concerned about. Calling them the "M&M" group, he says they face greater competition from workers overseas now that the Internet has made markets more connected. This is in contrast to workers in some lower-wage, or very localised, jobs such as hairdressers or hawkers who do not have to compete with counterparts overseas for now, he says, adding: "You cannot e-char kway teow yet." Many white-collar jobs do not have this geographical insulation - even basic engineering services can be transacted over the Internet. That is why this M&M group very much needs to retool to remain competitive and adapt to new forms of work, says Mr Chan. 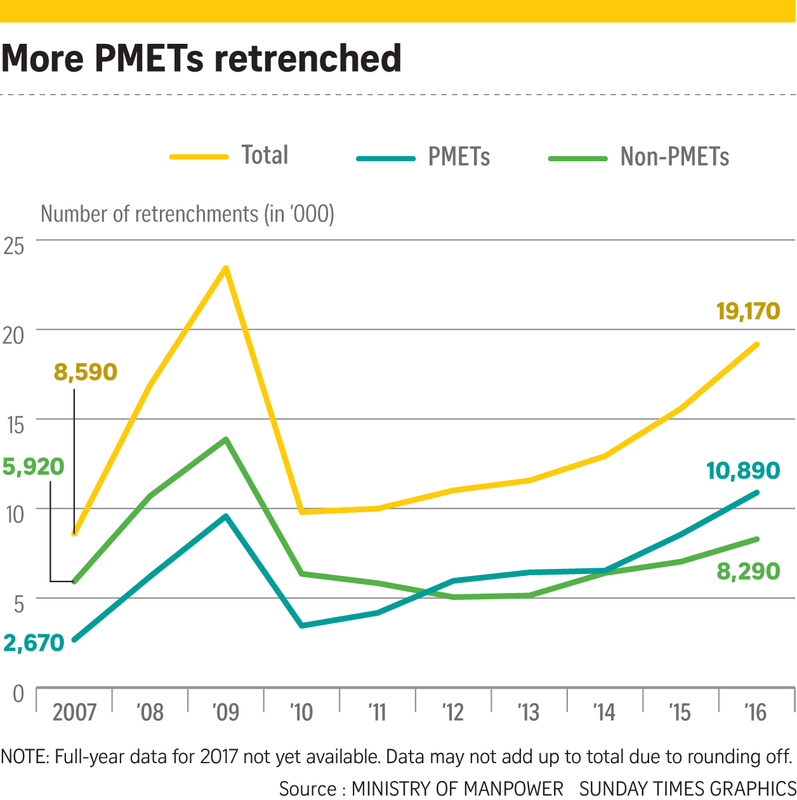 There are several government programmes to help PMETs move into new jobs, such as through place-and-train schemes in growth industries or wage subsidies for employers who hire older retrenched PMETS. Sometimes, job seekers need more than just technical help. The emotional struggle can become a major obstacle, says Mr Er, who completed a master's in counselling two years ago. He noticed that some clients would miss out keywords in resumes or forget to customise them, avoid networking, or dwell on the past during mock interviews. "If a person is feeling very down at home, it affects his productivity and job search," he says. Last year, he started discussing this challenge with colleagues at monthly meetings. They agreed that a structured system to "triage" job seekers would allow them to offer more targeted help. They raised this with the management team, who gave them the go-ahead to run a pilot programme from March to May last year with a few clients at the three WSG career centres in Paya Lebar, Woodlands and Tampines. The Career Recharger programme was officially launched in July. Coaches identify clients with emotional or psychological struggles through a series of questions, then use counselling techniques to help them cope. On how the name came about, Mr Er says: "Job seekers' batteries may be running low, so we want to give them a boost so they have more hope and energy." Between July and December, Career Recharger and two other new targeted programmes helped more than 1,000 job seekers, says WSG chief executive Tan Choon Shian. The programmes are for all types of workers. For Mr Er, one client stood out - a middle manager who had searched unsuccessfully for a job for about five months and found himself sinking into depression. The coaches encouraged him to establish a daily routine of heading out to the career centre or library, and to identify a support network among friends and relatives. A couple of months and several interviews later, he landed a job. "He came here in person to share the good news and take a photo with us," says Mr Er. "It really made our day." In line with the technological boom, the shortage of software, Web and multimedia developers is getting more acute. This group of workers tops the list of occupations with the most unmet demand last year among professionals, managers, executives and technicians, or PMETs. The latest Ministry of Manpower (MOM) job vacancies report, released yesterday, also showed a larger share of openings for PMETs, reflecting the overall shift towards higher value-added jobs.The figure rose a notch to 49 per cent of all vacancies last September, compared with 48 per cent the year before. Labour MP Patrick Tay said the shortage of software, Web and multimedia developers could be due to people trained in these areas preferring other jobs like IT project management. In the past, such work seemed to offer better career prospects, he said. "We need to change their mindsets and help them update their programming skills," he added, noting that more students now seem keen on coding. Job vacancies refer to openings for which employers are actively hiring workers from outside their businesses. In all, there were 53,100 jobs up for grabs as at end-September last year, down from 53,800 the year before and 60,000 in 2015. Employers were able to find workers more quickly last year, and the proportion of vacancies unfilled for at least six months fell to 33 per cent, down from 36 per cent in 2016. Part of the reason for the slide in vacancies could be that economic growth turned rosier in the second half of last year, said OCBC economist Selena Ling. Companies may have also invested more in technology to become more productive. For non-PMETs, there were fewer job openings. Maybank Kim Eng economist Chua Hak Bin attributes this to slower business in more labour-intensive sectors like construction and retail, which is facing disruption from e-commerce. "But this is in line with the shift to higher productivity, higher value-add sectors," he added. 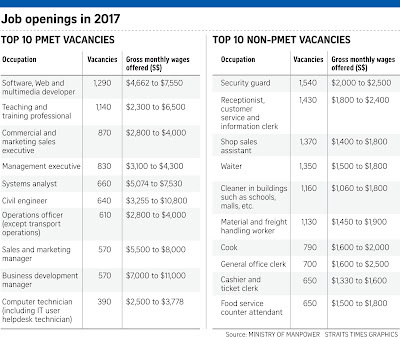 Other PMET occupations with most unmet demand were teaching and training professionals, commercial and marketing sales executives, and management executives. 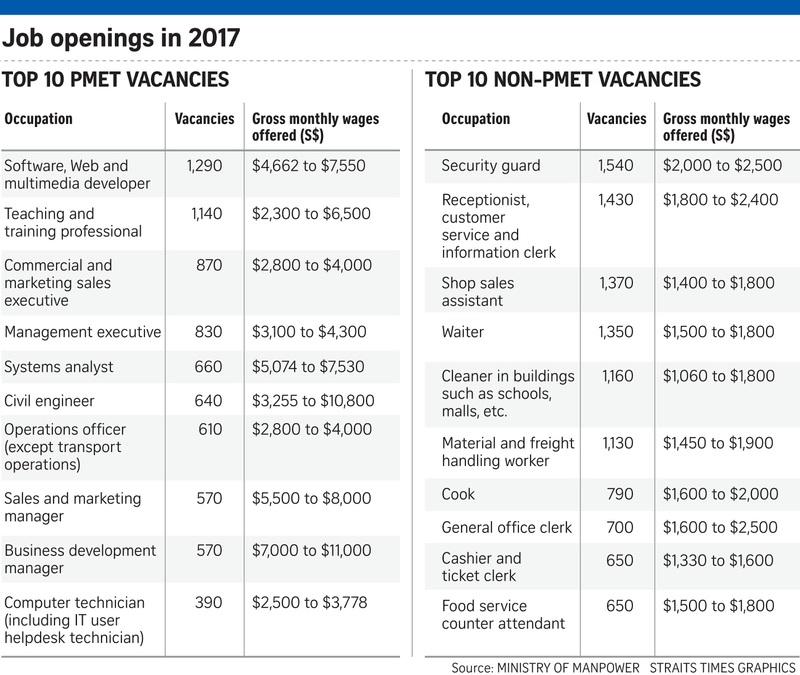 Employers cited the lack of relevant work experience as the top challenge in hiring local PMETs for hard-to-fill vacancies. For non-PMETs, the roles with the most vacancies were security guards, receptionists, customer service and information clerks, and shop sales assistants. Unattractive pay, working on weekends and public holidays, and shift work were among the main reasons people stayed away from non-PMET jobs that could not be filled for six months or more, said MOM. In the push to encourage employers to hire workers based on skills, this year's report also included a new metric on whether academic qualifications were the main consideration in hiring. It was not in four out of 10 PMET vacancies, said MOM. For non-PMET vacancies, it was not the main consideration for nine out of 10 vacancies. MOM urged firms to do more to redesign non-PMET jobs. To overcome skill mismatches, it urged employers to widen their pool of potential hires and tap government support for their hiring needs. Mismatches will be a growing challenge, as "the nature of jobs continues to evolve with technology and industry transformation", it said. When Mr Leon Yeow, 26, graduated three years ago with a business degree, he did not expect to find himself handling IT issues at a digital marketing firm one day. He joined Design Prodigy last September as a digital analyst, after working in sales and tax consultancy. While he had no IT experience or qualifications, he read up on his own and colleagues helped to vet his work at the start. Mr Yeow is glad that his boss appreciated his other qualities. "The company wasn't looking for academic qualifications but for qualities that mainstream education can't quantify, like fluid intelligence and the ability to look at problems from a wider perspective," he said. Others are also looking beyond education - a Manpower Ministry report released yesterday found that for four in 10 vacancies for professionals, managers, executives and technicians (PMETs) last year, academic qualifications were not the main consideration in hiring. The ministry included this measurement in its survey for the first time to monitor changes in employers' mindsets, said a spokesman. National Trades Union Congress assistant secretary-general Patrick Tay said the survey finding was an encouraging starting point. While the tighter labour market may also be a factor, employers also realise they can no longer get "plug and play" candidates with all the necessary knowledge, he said. "As long as you get people with the right attitude and mindset, I am sure you can help them pick up the skills." For Design Prodigy founder Marc Goh, hiring people from fields like economics and mathematics, then training them, helps him get around the shortage of local talent in the software development and marketing technology fields. He said: "Anyway, for the type of talent we need, it is no longer just about skills but cognitive abilities like imagination and experience." Mr Goh, who has seven staff now, said it is hard to compete for top IT talent with big overseas firms that can pay workers several thousand dollars more than small firms here. A junior marketing technologist - someone who operates software and codes - would earn around $4,000 at a small firm, he added. Recruitment firms like Adecco Personnel (Singapore) said employers are focusing less on paper qualifications and more on soft skills and technical knowledge when hiring. Kelly Services Singapore managing director and country head Foo See Yang said soft skills can help employers "assess cultural fit and suitability for the job".